This paper proposes a new design study for a three-phase permanent magnet motor. The radial flux machine has 12 pole type magnets in its rotor internally and a surface mounted stator has 36 coils surrounding the cores. Initially, a magnetostatic study has been performed, and then a 2D transient finite element analysis has been realized in order to verify the new design concept. Then, a harmonic analysis is performed to see the harmonic impact on the design performance and achieving a good prototype. The new-designed machine is promising since it gives symmetrical field structure under operation and the electromagnetic torques and current waveforms characteristics are good for different angular spreading of magnet. Kurt, E., Gör, H., & Döner, U, “Electromagnetic design of a new axial and radial flux generator with the rotor back-irons”, International Journal of Hydrogen Energy, 2016, 41(17), 7019-7026. <http://www.sciencedirect.com/science/article/pii/S0360319915314804>. Kurt, E, Gör, H & Demirtas‚ M, “Theoretical and experimental analyses of a single phase permanent magnet generator (PMG) with multiple cores having axial and radial directed fluxes”, Energy Conversion Management, 2014, (77), 163-172. <http://www.sciencedirect.com/science/article/pii/S0196890413005505>. Xu, L., Ye, L, Zhen L.,& El-Antably, A, “A new design concept of permanent magnet machine for flux weakening operation”, IEEE Transactions on Industry Application, April 1995, 31(2), 373-378. <http://ieeexplore.ieee.org/abstract/document/370287/>. Gan, J., Chau, K. T., Chan, C. C., & Jiang, J. Z, “A new surface-inset, permanent-magnet, brushless DC motor drive for electric vehicles”, IEEE Transactions on Magnetics, 2000, 36(5), 3810-3818. <http://ieeexplore.ieee.org/abstract/document/908381/>. Cheng, M., Chau, K. T., & Chan, C. C, “Design and analysis of a new doubly salient permanent magnet motor”, IEEE Transactions on Magnetics, 2001, 37(4), 3012-3020.<http://ieeexplore.ieee.org/abstract/document/947054/>. Gör, H., & Kurt, E, “Preliminary studies of a new permanent magnet generator (PMG) with the axial and radial flux morphology”, International Journal of Hydrogen Energy, 2016, 41(17), 7005-7018. <http://www.sciencedirect.com/science/article/pii/S0360319915312878>. Li, C., & Meng, T, “A new design concept of PMSM for flux weakening operation”, 19th International Conference on Electrical Machines and Systems (ICEMS), November 2016, pp. 1-5. 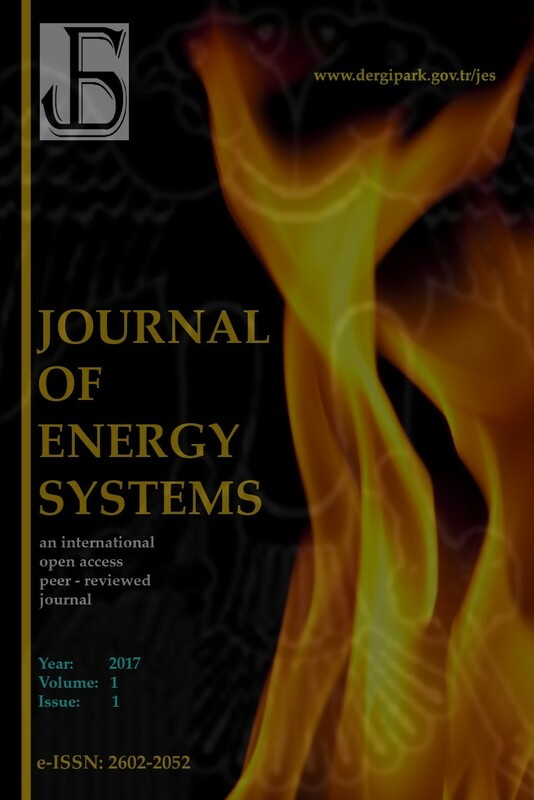 Fernandez-Gamiz, U, Demirci, M, İlbaş, M, Zulueta, E, Ramos, J.A, Lopez-Guede, J.M, Kurt, E, “Computational characterization of an axial rotor fan”, Journal of Energy Systems, 2017; 1(4):129-137. Collocott, S. J., J. B. Dunlop, P. B. Gwan, B. A. Kalan, H. C. Lovatt, W. Wu, & P. Watterson. “Applications of rare-earth permanent magnets in electrical machines: from motors for niche applications to hybrid electric vehicles”, In China Magnet Symposium, Xian, China, 2004. Jahns, T, “Getting rare-earth magnets out of Ev traction machines: a review of the many approaches being pursued to minimize or eliminate rare-earth magnets from future Ev drive trains”, IEEE Electrification Magazine, 2017, 5(1), 6-18. <http://ieeexplore.ieee.org/abstract/document/7873383/>. Qiao, Z., Pan, S., Xiong, J., Cheng, L., Lin, P., &Luo, J., “Electromagnetic and microwave-absorbing properties of plate-like Nd–Ce–Fe powder”, Journal of Electronic Materials, 2017, 46(1) 660-667. <http://link.springer.com/article/10.1007/s11664-016-4958-7>. Cavagnino, A., Lazzari, M., Profumo, F., & Tenconi, A, “A comparison between the axial flux and the radial flux structures for PM synchronous motors”, IEEE Transactions on Industry Applications, 2002, 38(6), 1517-1524. <http://ieeexplore.ieee.org/abstract/document/1058105/>. Arslan,S & kurt,E, “Design optimization study of a torus type axial flux machine”, In: ECRES 2017, 5. European Conference on Renewable Energy Systems; 27-30, August 2017: Vizyon Publishing House, pp. 1-9. Zhao, C., & Zhu, H, “Design and analysis of a novel bearingless flux-switching permanent magnet motor”, IEEE Transactions on Industrial Electronics, 2017. <http://ieeexplore.ieee.org/abstract/document/7878553/>. Faiz, J., Valipour, Z., Shokri-Kojouri, M., & Khan, M.A, “Design of a radial flux permanent magnet wind generator with low coercive force magnets”, 2nd International Conference on Intelligent Energy and Power Systems (IEPS), IEEE, 2016 (pp. 1-7). Park, H. J., Woo, D. K., Jung, S. Y., & Jung, H. K, “Modeling and analysis of magnet skew in axial flux permanent-magnet motor via field reconstruction method”, In Electrical Machines and Systems (ICEMS), IEEE, 2016, 19th International Conference on, pp. 1-4. Virtič, P., Vražić, M., & Papa, G, “Design of an axial flux permanent magnet synchronous machine using analytical method and evolutionary optimization”, IEEE Transactions on Energy Conversion, 2016, 31(1), 150-158. <http://ieeexplore.ieee.org/abstract/document/7277061/>. Hemeida, A., Taha, M., Abdallh, A. A. E., Vansompel, H., Dupré, L., & Sergeant, P, “Applicability of fractional slot axial flux permanent magnet synchronous machines in the field weakening region”, IEEE Transactions on Energy Conversion, 2017, 32(1), 111-121. <http://ieeexplore.ieee.org/abstract/document/7577790/>. A. M. El-Refaie & T. M. Jahns, “Impact of winding layer number and magnet type on synchronous surface PM machines designed for wide constant-power speed range operation”, Energy Conversion, IEEE Transactions on Industrial Electronics,2008, 23,53-60. <http://ieeexplore.ieee.org/abstract/document/4025413/>. Tangudu, Jagadeesh K., & Thomas M. Jahns, “Comparison of interior PM machines with concentrated and distributed stator windings for traction applications”, Vehicle Power and Propulsion Conference (VPPC), 2011, IEEE. <http://ieeexplore.ieee.org/abstract/document/6043171/>. Di,Tommaso, A. O.,Mastromauro, R., Miceli, R., Rizzo, R., & Viola, F, “Cogging torque comparison of interior permanent magnet synchronous generators with different stator windings”, 6th International Conference on Clean Electrical Power (ICCEP), IEEE,2017. <http://ieeexplore.ieee.org/abstract/document/8004780/>. Andrews, R. M., & Andreas, M.,“Lorentz force in filtration of fibrous preforms”, MetallurgicalTransactions A, 1991, 22(12): 2903-2915. <http://link.springer.com/article/10.1007/BF02650251>. Arslan, S., Fidanboy, H., Demirbas, S., Guven, M. E., & Kurt, E, “Investigation of current harmonics using FEM on different rotor types of PMSMs”, In Information, Communication and Automation Technologies (ICAT), October 2011, XXIII International Symposium on ,pp. 1-7. Sistaninia, M., Phillion, A. B., Drezet, J. M., &Rappaz, M, “Simulation of semi solid material mechanical behavior using a combined discrete/finite element method”, Metallurgical and Materials Transactions A, 2011, 42(1), 239-248. Rao, MV, Rama, Robert, L. Mullen, & Rafi L. Muhanna, “A new interval finite element formulation with the same accuracy in primary and derived variables”, International Journal of Reliability and Safety, 2011, 3(4): 336-357. <http://www.inderscienceonline.com/doi/abs/10.1504/IJRS.2015.072716>. Neorem Magnets Co., Technical manual, (2003). Kurt, E & Gor, H, “Electromagnetic design of a new axial fluxgenerator”, 6th international conference electronics, computer and artificial intelligence ECAI, Oct 2014, in: IEEE proc, pp.39-42. Benakcha . M, Benalia, L, Ameur. F, Tourqui . D. E, “Control of dual stator induction generator integrated in wind energy conversion system”, Journal of Energy Systems 2017, 1(1), 21-31. <http://dergipark.gov.tr/jes/issue/30882/331059>. Rocha, J. E.,& C. Sanchez, “The energy processing by power electronics and its impact on power quality”, International Journal of Renewable Energy Development, 2012, 1.3, 99.